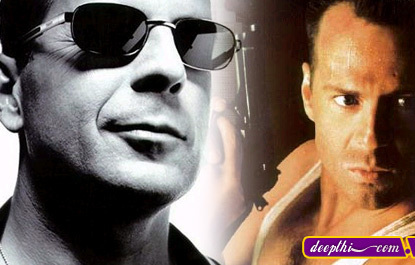 Born Walter Bruce Willis, on March 19, 1955, in Idar-Oberstein, West Germany. The Willis family moved from a West German military base to the small town of Carneys Point, New Jersey, when Bruce was two years old. He grew up as the oldest of four children in a blue-collar family (his father, David, was a welder). As a teenager, he worked in a DuPont chemical plant. After graduating from high school, Willis attended Montclair (NJ) State College, where he first became interested in acting. He left college and moved to New York City in 1977, when he landed a bit part in an Off-Broadway play. In New York, he supported himself by working as a bartender in between small roles in stage productions. He was married to actress Demi Moore (1987�98). He grew up in New Jersey from the age of two, took up acting in the mid-1970s, and got some small parts in film and television. After moving to Los Angeles, he became widely known for his role as David Addison in the television series Moonlighting (1985�9). He made his film debut in Blind Date (1987), and achieved star status following his role in the first of the Die Hard series (1988, 1990, 1995). Later films include Pulp Fiction (1994), Armageddon (1998), The Sixth Sense (1999), Bandits (2001), and Sin City (2005).